Server-level email signature solutions for Office 365 have several advantages over client-based systems. They are easier to deploy, immune to end-user tinkering, changes are easier to introduce, you don’t have to worry about the variety of email clients and devices in your organization, and so on. But they also used to have one major drawback – the email signatures were not displayed on the user-end. Today, we are happy to announce that this is no longer a problem. 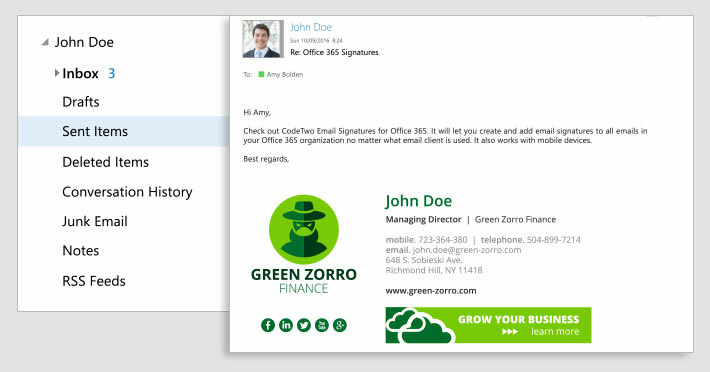 CodeTwo Email Signatures for Office 365 has just become the first server-level email signature management system for Office 365 to support displaying signatures in users’ Sent Items folders! NOTE: Existing users who wish to obtain this feature are asked to send a request to CodeTwo Support. 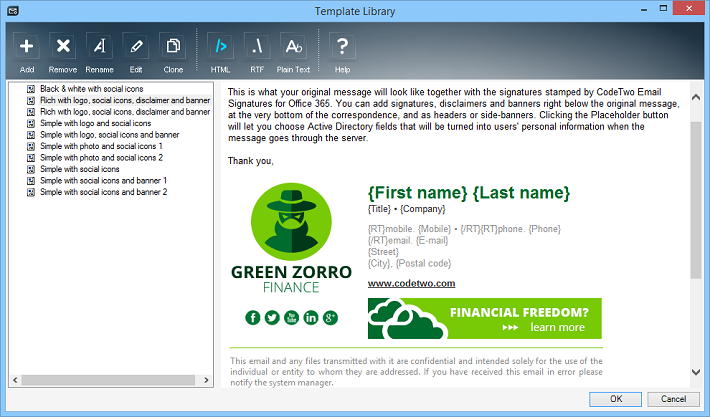 We have prepared a library of business-friendly email signature templates equipped with Azure AD dynamic fields, social media icons and banner boxes. You can use them as starting blocks to your own designs (in which case CodeTwo Email Signatures for Office 365’s intuitive WYSIWYG editor will come in handy) or just upload your banners, paste your links and click OK.
CodeTwo Email Signatures for Office 365 can now convert Plain Text messages to HTML on the fly. One click and next thing you know, text emails are stamped with professional email signatures that include logotypes, links, tables, social media buttons, banners and whatever else you can think of. This inconspicuous option is actually a lifesaver when you are dealing with multiple rules that may or may not come into conflict with each other. Define what the application should do when a given rule is or is not applied and you can be sure that your settings will be correctly applied. Reading about the benefits of an application is one thing, but nothing beats live experience. The trial works for 14 days and does not require credit card details. In case of any questions, please contact us! We are open 24h Monday through Friday.